A common impediment we hear in #CSM classes is whether to share the actions and outcomes from the Sprint Retrospective outside of the Scrum Team (product owner, scrum master, development team). When we ask for more clarification students make comments such as “the Senior Leaders want to know that we’re really working” or “Senior Leadership wants to know that we are improving” and also “Senior Leadership wants to make sure we’re doing work”. A great question for the Scrum Master to ask those Senior Leaders is “What problem are we trying to solve by sharing Sprint Retrospective actions and outcomes?”. It may also be helpful to ask those same leaders what information they need and take advantage of that teachable moment to let them know the appropriate place to get product information such as from Information Radiators and Task Boards. Are the leaders regularly attending the Sprint Reviews to see working product and to get current information on the product? If they are not attending, why is this the case? And most importantly, do leaders understand that the Product Owner is the one to go to for information on the state of the product. Principle #5 in the Agile Manifest states: Build projects around motivated individuals. Give them the environment and support they need and trust them to get the job done. To be most effective, there needs to be psychological safety in the Sprint Retrospective. How likely is that to occur if the Scrum Team learns that the Scrum Master publishes a report or meeting minutes of what gets discussed to senior leadership? 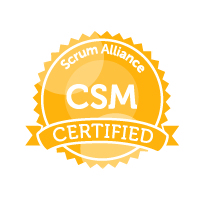 If trust is the issue the Scrum Master may have some work to do with leaders and the development team to build trust. The intent of a Sprint Retrospective is for the Scrum Team to agree on 1, no more than 2, process improvements within their control to implement in the upcoming Sprint. It's up to the PO if it's for them to enact or a member of the team to champion the improvement if it’s for the development team. There's no "minutes" or log or output or any of that because it's a Sprint Retro. The 1 item is implemented. If it’s really necessary to have a reminder something can be put on the Task Board for the upcoming Sprint. If the Scrum Team gets to the next retro and determines that the process improvement wasn't really helpful, they can inspect and adapt and try something else. If it had the desired effect, it can be determined to keep the process improvement permanently and move on to brainstorming another improvement that's relevant for that current Sprint.